This photograph is of a portion of one of the walls in my “studio.” Mixed in with some of my works in progress are images from which I have drawn inspiration. 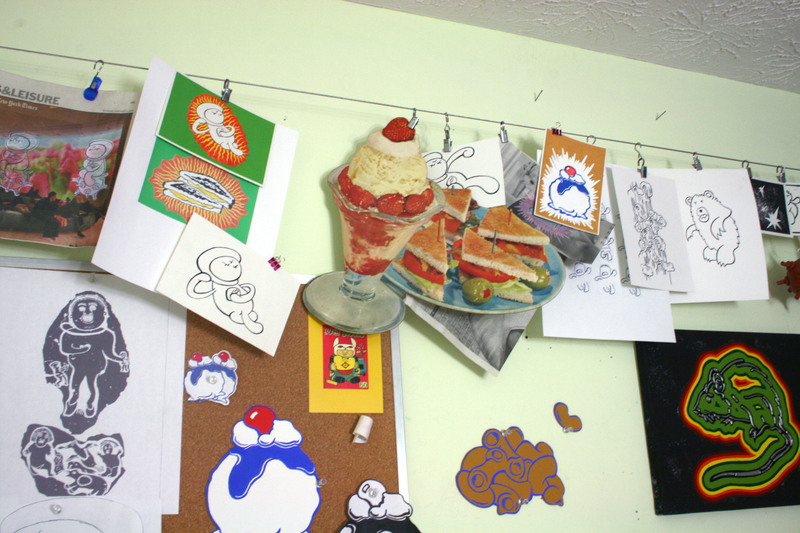 The cut-out of the sundae & sandwich in the center is something Joy and I picked up in SoHo one day. It used to hang in our kitchen, both in Brooklyn and Indianapolis. It is part of the inspiration for the Desire piece. On the lower left is a photo copy from the book Ellen gave me on Inuit Art, which is a rubbing relating to a myth about a giant who comes to a village and is thwarted by the villagers. This was the inspiration for my Astronaut, who appears in many of my current works. There is also a Japanese illustrated post card I found going through some things here at the house. And on the lower right is a work by a friend, Jon Waldo.